Leaves have gathered at the entrance to the museum. Their fading greens revealing crimsons and yellows, colourful cut-outs; edges scorched brown. I pause to admire their rich hues and enjoy the warmth of the sun on my shoulders. Solar rays. The energy of the sun falling on me as it does on everything around me. This is a mustard-brown autumnal day. The low angle of light more humble – less bombastic – than high summer’s steep verticality. Its tender slant softens the hard edges of London; glass and metal gleam rather than shine, windows look sleepy. Shadows take up more space around me. They draw my attention to the edges of what’s visible. In the shadows, the straight line of time’s chronology, the this, then that, and after that, this; begins to fray, its aim a less accurate guess. Honk, honk. Honk, honk, honk. A skein of geese flies overhead, intent on a journey which may take some time. Their slow calls contrasting with the frenzied twittering of a nearby tree, in which a flock of sparrows have congregated. The sounds I can hear make me think about those that I can’t – the insects looking for lunch behind me in Brunswick Square. Bees flying sleepily in and out of the last of the summer roses and ants making their way over fallen leaves and dropped berries. And underneath the ants, worms stirring dead plant material into the upper layer of the soil only for it to be fragmented and blended into the layer underneath by tiny bacteria and fungi. All the different rhythms of these movements, a complex choreography, an entangled story. Lost in thought, I might have paused long enough to sit the clock round. Instead, I walk forward. I walk forward up the museum’s steps, to go backwards into the past. Going into a museum feels like stepping backwards in time because a museum’s objects point to ways of doing things that have been abandoned or forgotten. Habits that are no longer habitual. The building that houses the history of the Foundling Hospital – the Foundling Museum – has stood next to Brunswick Square since the 1930’s. It’s original building, present on the same spot, was demolished as part of the transformation from institution to museum. Everything was demolished except the plasterwork, furniture and furnishings of its ornate Court Room which were saved and reconstructed into a new version of the old. I try to imagine the labour involved in painstakingly taking apart the elements of the Court Room, but my attention is drawn to the corners of the room as if I can see time gathered like dust; dusty old time, settling in the shadows. Meanwhile, other museum visitors are coming in and out of the room. Some hesitate on the threshold, taken aback by its haughty opulence. I hear one child remark, look at the drawings on its sky as she points at its ceiling. Like most museums the walls and cabinets are full of paintings and objects. Everywhere you look, on each of the museum’s floors, there are gestures: hands folded, crossed, extended, raised; hands holding a letter or a book; a hand on a wrist, taking its pulse; a face against a curtain as an unseen hand draws it closed; the side of a face next to a little doll in a blue dress; the side of a hip with a fist pressed into it. The hands are small, chubby; slender; veined. The faces are pale, soft, angular, moustached. And the eyes! They’re everywhere, many of them male, looking forthright or proud; confident or certain. They cast their gaze down, they aim their sight. The Foundling Hospital was set up as a charitable organisation to provide care for children whose mothers were unable to care for them. In order not to be seen to encourage illegitimacy, the Hospital required that hopeful mothers petition the secretary with a document that included a short narrative of their circumstances and a reference regarding their moral character. If their petition was accepted, their child would be taken in and immediately re-named in order to provide them with a new beginning and to remove the stigma of their origin. The thousands of names (over forty thousand during the lifetime of the institution) are held on microfiche at the London Metropolitan archives. The registers only contain the date the baby arrived, the new name and a number. Names that appear in the registers include: Henry Agincourt, William Conquest, William Shakespeare, Christopher Wrenn, Oliver Cromwell, Francis Drake, Philip Sidney, Michael Angels (sic). Imagining the namesakes of these historical figures offers the vision of a world in which time collapses in on itself and William Conquest might be found sitting at a desk next to William Shakespeare. And then there are many names that are also nouns – Elizabeth Star, Jane Chair, Ann Valley, Richard Shovel, Arthur Stone, Mary Ant, Abraham Plinth. And then there are kinds of weather – Martha Rainbow, Julia Snow, Elizabeth Frost, John Tempest. Certain names stand out amongst those around them. Foundling Number 715 was simply called ‘Sweet Rose’. The little infant stops crying for a moment to take a hiccup-y gasp of breath. You close your eyes and let your finger pick a name – Samuel Hull. Samuel Hull, yes, that will do. Or maybe on this day you walk to work on a full stomach with the warmth of the sun on your back, and the world feels full of possibilities and you love the part you play in overturning misfortune. Something about the mother who gently knocks on the door touches you deeply and as you look at her sleeping baby you experience an unexpected feeling of connection and love which causes a name to appear, unbidden. A name that feels like it must be right. A name that reveals how this child moved you and what you hope for in her future. A name like Sweet Rose. In the act of renaming the child as she or he arrives at the Hospital, a particular door is opened, whilst all the others are closed. Sweet Rose will always be haunted by her lack or abundance of sweetness. During an artist’s research residency at the museum, over a few days when the museum is tranquil yet occupied, I invite people to hold a magnifying glass and ask them to describe something they notice in an object or painting when they look at it close up. One young woman, her hair a cascade of curls, chooses the Court Room’s clock. When I ask her why, she says that she feels, a relief at its lack of ornamentation. After examining the clock, (which was made by a Spanish clockmaker – JR Losada – in the 1850’s) she remarks that it is an odd blend of the mechanical and the natural and that she likes, the slight mottling on its case. She pauses for a moment and then remarks that we all look for faces in other things and that the face of this clock is strangely compelling to her. she knows that a gap has occurred and she is perceptually awry. This she has come to understand is a clue that the neurological storm of her migraine will soon arrive. H, her boyfriend C and I are meeting in a pub and what has prompted this remark is my apology for my late arrival due to time navigation issues. Time navigation issues caused by a migraine. In turns out we are all migraineurs and we exchange details of the various oddities of our differing migraine-related symptoms. Heavy air pressure is definitely a trigger, I say. Flying. Staying up too late or getting up too early. We all nod in agreement. It never comes when I am in real trouble. Tell me that my house is burned down, my husband has left me, that there is gunfighting in the streets and panic in the banks, and I will not respond by getting a headache. It comes instead when I am fighting not an open but a guerrilla war with my own life, during weeks of small household confusions, lost laundry, unhappy help, canceled appointments, on days when the telephone rings too much and I get no work done and the wind is coming up. We all agree, that the duration of a migraine equals a hiatus. The migraine acts as a circuit breaker intervening in our bodily systems, sending us underground, causing us to lie fallow in a lacuna of our own making – stopping time, momentarily. Standing in the Court Room at the Foundling Museum, the young woman, L, says that the sound of the clock has a visceral effect; it echoes a heartbeat. It’s a weird melding of the mechanical and the natural. I stop nodding my head and listen to see if I can hear what she is hearing. We stand side by side, a little island of stillness in the busyness around us. After another moment she says the sound of this particular clock takes her back to a memory of visiting her grandparents. Longcase clocks are colloquially called Grandfather clocks. The story goes that a song written in 1875 called, My Grandfather’s Clock caused the name to stick. The song tells the story of a clock in a hotel in Yorkshire owned by two brothers. The clock was unusually accurate in its timekeeping and the brothers were exceptionally fond of it. They enjoyed looking up at it, checking its time against the time of their pocket watches, its accuracy constant. Constant that is, until it started losing time. At first it slowed by five minutes a day, and then by fifteen. The elder brother fell ill and the younger brother took over the daily business of the hotel and continued to fret about the lost time. A clocksmith was brought in to diagnose the problem, nothing mechanical seemed at fault. The clock carried on losing its time; nobody knew what was wrong with it. The clock finally stopped for good on the day that the elder brother died. And it kept in its place, not a frown upon its face / And its hands never hung by its side / But it stopped short, never to go again / When the old man died. In the Foundling Museum there are thirteen clocks which keep time differently and strike the hour or the quarters out of synch. This lack of agreement about time creates a very particular feeling. A sense of time being multiplied, or a sense of parallel times all happening at the same time. Perhaps even a sense of time splintering – falling apart, beside itself. What is this clock lower than most of the rest, and nearer to the ear, that lags so far behind to-night as to strike into the vibration alone? This is the clock of the Hospital for Foundling children. The clocks are wound once a week on a Wednesday and the volunteer – M – who does the winding, lets me follow her around so that I can record each clock’s sound as she does so. M tells me that the clocks have different personalities and she admits to certain biases. The clocks are affected by the weather. Moisture or dryness in the air causing less or more resistance in the action of their time-keeping. M opens the door of her favourite clock – a longcase clock by James Foulsham of Norwich – and I see how attentively she listens to it. Peering inside the body of the clock, she resembles a doctor, stethoscope hovering over the patient’s heart, listening for inner rhythms. I have the sense that being listened to so attentively soothes each clock. Almost as if M were a clock-whisperer, cajoling each clock to remember its uniformity; a more orderly sense of time. This one sounds quite contented, she says. Did you hear how that other one was wheezing; like it was struggling to climb the stairs? When you listen to a succession of clocks you realize how differently they resonate and how variable their beat is. Opening up a clock to minister to it is a surprisingly intimate experience. head, is like putting a bowl of water down on the floor for a silence to drink. Thirsty silences devastate. Thirsty silences devastate. M shuts the door of the last clock just before two o’clock and we wait. As the hour turns all of the clocks chime twice, in unison. Now M has become a clock conductor. But her orchestra is wayward and by five o’clock the same afternoon the clocks are diverging once again. When a clock’s case is open, you can see the long swinging rod of the pendulum and feel the relationship to its tick, swing, tock, swing. 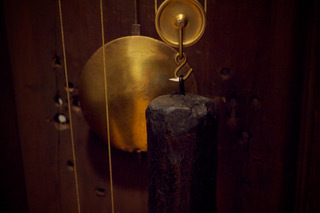 The pendulum swings through the space of the clock’s case, a tiny pause at the end of each oscillation. It’s the friction of air ‘resistance’ that causes the pendulum to slow and to eventually need rewinding. As the friction causes the pendulum to lose energy, it nevertheless takes the same amount of time to complete each oscillation. This ability allows the pendulum to keep time equally, to have the quality of ‘isochronism’. This ability is what enables mechanical clocks to be so (relatively) accurate. 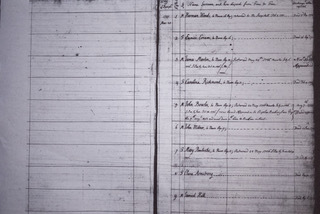 The children who lived in the Foundling Hospital experienced extremely regulated lives. Their movements were synchronized, just like those of watches or clocks. Beginning and endings were demarcated by the sound of a bell, or with an instruction from a member of staff. All of us experience some form of time management as children, but for the foundlings this extended to moments like brushing their teeth. Cleaning teeth became small choreographies of brush and toothpaste; of swirling and spitting. Many former pupils as well as writers like Dickens remark on it, so it seems like there was something particular about this horological patterning of childhood. The rhythmical swinging movement of a mechanical clock’s pendulums links it to the inner rhythm of human bodies. At every scale of our organic functioning, changes are shaped through oscillation. From heartbeats, to temperature regulation, to sleep patterns and cellular activity, the body’s rhythms are organized by oscillation. In mammals the rate of the heartbeat is in inverse proportion to the span of life. An elephant’s heartbeat is seven times slower that a mouse’s. I think about walking down the street next to a friend and how much easier it is to walk in rhythm together, arms and legs swinging in tandem, the smallest adjustment of self to the other creating a sense of ease. It makes me wonder if the foundlings fell into each other’s rhythms; if they noticed this and felt comfort. Or if they were desperate to pull out of synch and like the Foundling Hospital clock make themselves felt differently, distinctly.